American Punch Co., Euclid, OH, has delivered its expanded 68-page catalog, showcasing an extensive inventory of metalforming tooling. It includes detailed drawings and dimensions of tooling such as punches and dies, shear blades, coupling nuts and other related tooling. Also listed: stock sizes of tooling available for immediate shipping. 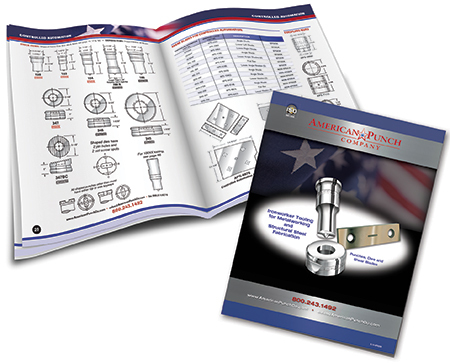 In addition to tooling available from American Punch, the catalog contains important tips and industry advice for successful punching, proper punch and die setup; and relative calculations for determining required tonnage, diagonals and more. American Punch manufactures punches, dies, shear blades and other tooling used in the structural-steel and metal-fabricating industries. Also, American Punch supplies precision die components to the stamping, rollforming and metalforming industries.